Christmas lunch and dinner in London - 2019, plus London restaurant deals. If you're looking for somewhere to eat on Christmas Day, or just a great dinner (or lunch) during the xmas period, you're on the right page. 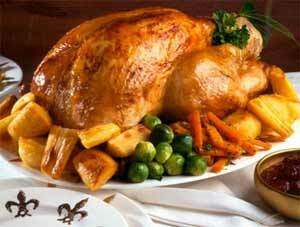 You can have unforgettable Christmas lunch while cruising down the Thames viewing the amazing sights of London. We seriously recommend abandoning the kitchen on Christmas Day and eating in one of London's great restaurants. You absolutely have to book for Christmas lunch or dinner, and of course many restaurants are closed. For traditional Christmas lunch, the statistics say that almost half of Londoners will eat turkey, but roast beef, lamb and duck are popular. Other than traditional Christmas pudding, other regular delights include Mince Pies (they do not contain meat, just fruit) and mulled wine. Based on personal experience, I'd say that perhaps 2/3 of people eat their big christmas meal at lunch and the other 1/3 eat christmas dinner. And probably, if truth be told, everyone who has lunch ends up eating it at 4pm because they under-estimate how long it takes to cook all the extra food! I’ve grown up my entire life celebrating Christmas morning in Southern California. My first Christmas in England was definitely an eye opener. The first broadcast royal speech on Christmas Day was from King George V in 1932. Originally only on the radio, today the message is broadcast on television, radio, and the internet by Her Majesty Queen Elizabeth II. If you're looking for information about Christmas in London 2019, then you're visiting the right site. And don't forget to read our blog. Obviously London is an amazing place for Christmas shopping, but it's also home to amazing parties, great carol singing and all kinds of festive fun. We know what to do in London at Christmas! Many London stores open late in the run up to Christmas, and some of the smaller boutique stores actually hand out free drinks and cakes to get everyone into the festive mood. The tradition of giving away glasses of mulled wine has almost disappeared in London due to a crackdown on serving alcohol from unlicensed premises!